Karenlovesraw: New Cream filled cookies. I made some Chunky Choc Chip Cookies and just felt that they needed something extra.. so a made a chocolate cream and filled them.. I think they are amazing. 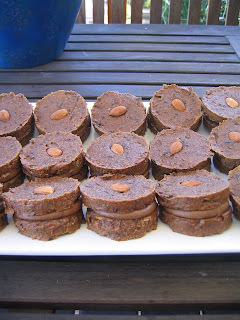 Nice and sweet and gooey.. with little bits of crunchy raw cacao nibs.. Devine!